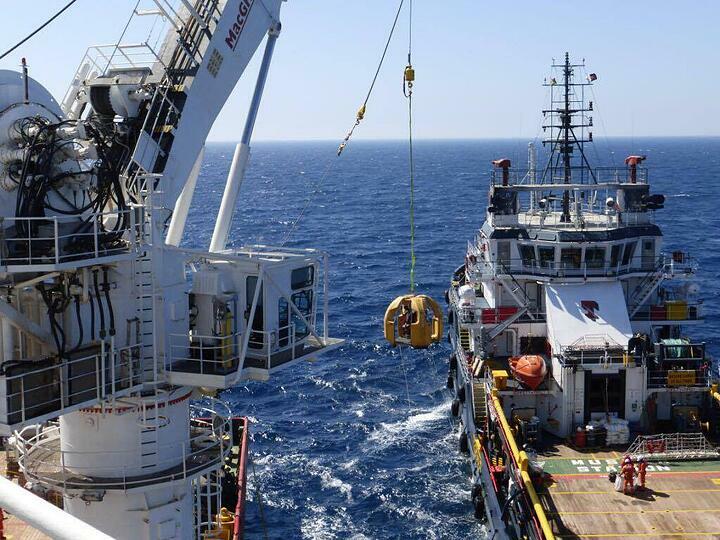 When we talk about offshore crew transfer, it often sounds “either / or” – either you use helicopters, or you use crane transfer; either you use crane transfer, or you use gangway. In practice, in real life situations, things are never that black or white. Commuting to work onshore looks simple in comparison. Every morning we make a choice how to get to work – walking, cycling, taking the metro, or a bus, or driving a car. Going to work offshore doesn’t give us that many options, and the way of commuting is predefined by the operator. Helicopters are good for getting people from the port to remote installations in deep water; gangways are useful when we need to get large number of crew from a vessel to the platform; and then there is transfer by crane, which gives flexibility and cost effectiveness. Thirty years ago transferring people by crane had its challenges – people were transferred in net “baskets”, unprotected and exposed. “How can we keep the cost effectiveness and flexibility offered by crane transfer while ensuring people are safe and protected from impacts and harsh weather?” was the question Philip Strong, Reflex Marine’s CEO and the person behind the FROG idea, kept asking himself as he embarked on a journey of improving safety of offshore crew transfer. Several years later the first FROG was sold. The original FROG range was launched in 1999 and fifteen years later the re-designed and re-engineered FROG-XT range was introduced to the global market. The FROG-XT Personnel Transfer Carriers (PTCs) are personnel transfer device designed to provide increased passenger protection when carrying out the transfer of personnel between vessels and installations. Crane personnel transfers are carried out for a wide variety of reasons including routine, urgent operational and emergency reasons. The FROG-XT can accommodate a stretcher to transfer injured personnel in a protected environment. The FROG-XT comprises the following two main assemblies: firstly, the stainless steel outer framework containing polyethylene buoyancy panels; secondly, a spring-dampened seating assembly mounted on a central column. All materials have been selected specifically to minimise corrosion in the marine environment. The outer framework protects passengers from impacts and contains the buoyant elements which ensure the FROG-XT floats and is self-righting in water. The outer shell lands on four feet that provide shock absorption and ensure that the FROG-XT is stable on uneven surfaces or when landing on a heaving vessel. The outer shell also has four large open accesses that allow rapid unimpeded entry and exit. During transit passengers are seated and secured with full harnesses to protect them against whiplash and falling. Seating is mounted on a sprung carriage to provide protection against heavy landings. The lifting assembly is of a special design to prevent rotation. 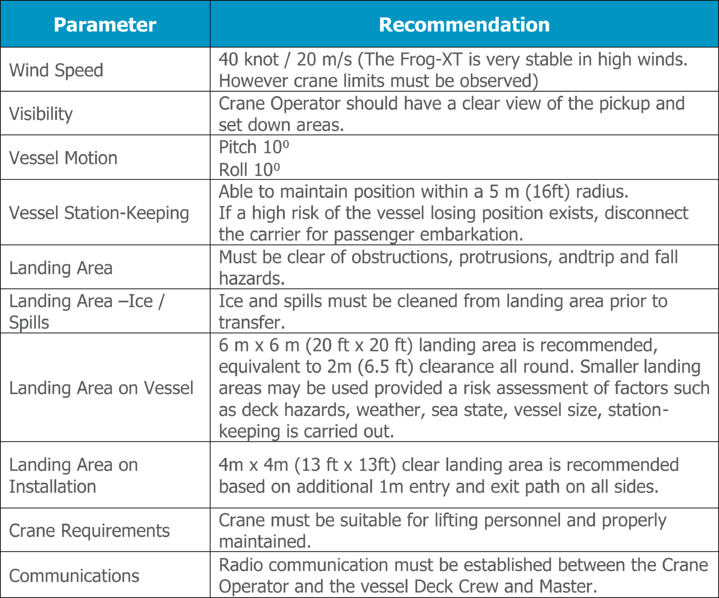 Operational performance for the FROG-XT can be described in terms of the following factors: » Passenger protection against vertical impacts ; » Passenger protection against horizontal impacts; » Stability of device (on pitching deck surface); » Upright flotation level of device (for maximum load and in stretcher configuration); » Self-righting of device from inverted water immersion. As with the vertical impact, the procedure to establish operational guidance to mitigate passenger injury risk from horizontal impacts is as follows: » Define passenger biomechanical limits for vertical impact; » Assess damping performance through engineering model; » Damping system limits; » Passenger deceleration; » Translate results into operational guidance. Modelling the deceleration of passenger in a horizontal impact is made highly complex by the multitude of factors involved. These factors include: » The number of components within the assembly: buoyancy panels, external frame, central column assembly, seat assembly, and seat harness; » The angle or orientation of impact, where different combined stiffness may arise from different impact angles; » The response of the passenger within the seat assembly for any given orientation to the impact and tension of seat harness. A previous (FROG-3) assessment of horizontal impact deceleration was made from observing the deflection of the central column during a full-scale impact test. On this methodology the MIRA report (Motor Industry Reseach Association/ Authority - a report into biomechancial effects and risk of injury from vertical and side impacts of a seated passenger (in a Frog). Reflex Marine Ltd. commissioned a detailed report from Motor Industry Research Association (MIRA) in 2003 to investigate and advise on recommended declaration limits linked to the prevention of injury) notes: “…this assessment is likely to over-estimate the neck forces to and even greater extent than for the vertical forces. This is because it considers that the lateral acceleration of the head is the same as that of the seat, and ignores the additional torso deflection permitted by the seat belts, as well as the relative head movement permitted by the flexibility of the neck”. » Immersion testing of the flotation level, stability and self-righting of unit properties of the unit. There are a large number of factors that affect the safe conduct of marine personnel transfers. These include crew skill and experience, met-ocean conditions, landing areas, vessel station keeping capability and response to sea conditions, visibility and line of sight. A combination of many factors will determine the risk involved. Before Reflex Marine’s work began, there was no central database for marine transfer incidents. By collecting and analysing data spanning a 20-year period, the company was been able to isolate when and where these incidents happen. Crucially, this allows us to consider how best to protect personnel with the carriers we create. As expected, the study showed that most incidents happen on the vessel itself. Less predictable was the high level taking place during pick-up, which can result in serious injuries or fatalities, compared to those caused by heavy landing, which are more likely to result in minor injuries. From detailed analysis, it was found that many incidents are caused by the pendulum ‘swing factor’: an often unavoidable misalignment between the crane line and the transfer device. The research showed that the pivotal risk factors in transfers are equipment design and crane operating error. Very few incidents relate directly to the condition of the transfer device or crane; instead, the design of the equipment often has a powerful effect on its safety. A lack of training, planning and preparation was also a concern in a considerable number of the incidents studied. Using these findings, Reflex Marine tailored their carriers to address the specific risks crews face. With falls during pick-up causing serious injuries or even fatalities, Reflex Marine developed devices that offer additional safety measures. Passenger fall restraints are a design essential in all of their carriers, preventing loss of grip or dislodging. A protective outer frame and buoyancy panels reduce the dangerous effects of side impact, which frequently results from the pendulum ‘swing factor’. Reflex Marine also put in place comprehensive training programmes to encourage safe practice. Read the rest of the magazine here.